Walking through your local hobby shop, a box may catch your eye in the board game section. The chibi anime styling of Super Dungeon Explore is hard to miss. And that isn’t surprising given that the aesthetic comes from the strange and wonderful minds at Soda Pop Miniatures. Likely your first question will be somewhere in the neighborhood of, “What exactly is that”, though you may choose to be more colorful. If you’re a fan of miniatures in general you may be familiar with the two names you’ll see printed on the front. The first is Soda Pop Miniatures, the creative force behind the game as well as the Relic Knights line of 32mm scale, Anime styled Miniatures. The other, Cool Mini or Not, is working to distribute the game and is renowned for their extensive selection of amazing miniatures. Those are two names you wouldn’t expect to see in the board game section. That brings me to what the game is. In a nutshell, Super Dungeon Explore is an old school dungeon diving adventure that takes you back to video games akin to Gauntlet; the video game influence is clear when you see that actions are represented by buttons and movement on a d-pad graphic. Flipping the box over you’ll get a better idea of what you’re dealing with. The game consists of over 50 miniatures, far more detailed and of higher quality than what you would expect see in a board game, a set of custom dungeon battle dice, stat cards for the heroes and minions, cards to make up the loot you’ll have to find to stay alive and a set of double sided boards that make up the dungeon. To focus in on the minis a bit further, these are not your everyday board game minis. They are detailed, multi-part plastic affairs like you would expect to find in the product lines of a table top game such as Warmachine or Warhammer. One part of that previous sentence may have jumped out at you, yes they are multi part minis. That can be a shock to someone buying a board game and expecting to find the usual bland, soft plastic one piece items.The parts are already cut and are keyed to allow easy assembly but you will need to get some good super glue before you start. Assembly is pretty straightforward thanks to the keys but Soda Pop Miniatures has also released an assembly guide to help you through the process. (find it at their Facebook page: http://www.facebook.com/pages/Soda-Pop-Miniatures/99556434458) How long assembly will take is going to depend on your experience with mini assembly, but in the end it will be worth it. I’d recommend considering scraping or scoring the locations you will have the glue contact, the red plastic in particular is very smooth and can lead to a long cure time for the glue otherwise. A few of the smaller pieces and the dragon may try your patience. Use care, the pieces will bend, but only so far. The quality of the minis is such that hobbyists will be happy to paint them, the plastic isn’t brittle and is stiff enough that you won’t have to worry as much about them bending and ruining the paint job. The chibi look will give you the cutest evil monsters you’ve ever seen as well as a solid set of heroes to build your party with. Once you get your minis assembled it’s time to start playing and you will not be disappointed. The game supports 2-6 players currently; with one player taking control of the Dark Consul and the other players taking control of one or more heroes. There are two basic sizes for the game, 3 heroes and 5 heroes. The number of heroes you play with is also correlated to the number of minions the Dark Consul will have, the size of the dungeon, and the length of the game.The player(s) who are playing as the heroes will chose from the figures included in the box. These represent what you’d expect from any fantasy dungeon adventure from your rogue to your dwarf fighter, each with unique abilities to offer your party. There is enough variety among the heroes in the box to let you create some varied parties. The Consul will get to choose his dungeon boss, mini boss and spawning pits to make up his dark army. Unlike the heroes there is not much variety included for the Dark Consul to mix things up. There is currently a single dungeon boss, mini boss and 2 types of spawning pits. But fear not, more are in the works.The game play is streamlined with rules focused on the key points and keeps the game moving. 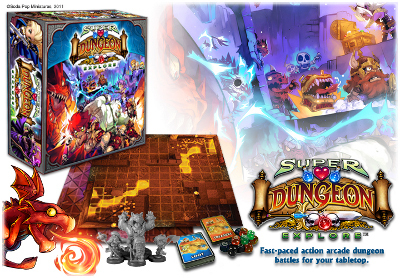 Unlike some games you may encounter, Super Dungeon Explore is designed to move toward the conclusion of the epic boss battle at the end of the dungeon. It is very hard for this game to stall. Every wound dealt by the Dark Consul’s minions or by the heroes moves you further towards that final showdown. Dealing wounds to minions is also one of the two ways the heroes earn their loot, holding back just means the party will face the boss naked and that never ends well.Loot is represented by cards drawn randomly and placed around the hero’s stat card. Each hero has space for 4 items that are designed to make it clear where they can be equipped, both with the color of the card and with the location it sits under the hero’s card. It creates a very streamlined system for the loot that is easy to appreciate as you play. The consul may feel a little overwhelmed early in the game by the heroes’ efficacy at killing his poor little kobold friends. But fret not, there are plenty more minions where they came from and as the game progresses you’ll reach the point where you can bring out your mini boss to start putting a beating on the heroes. If the heroes didn’t dive in aggressively enough and deal with some of your spawning pits, they’ll soon be the ones feeling overwhelmed. Overall, Super Dungeon Explore is a game I would recommend to anyone who just wants to have some hack and slash, dungeon diving fun in boardgame form. The game is well made, with beautiful miniatures and a look that really ties everything together. The rules are simple and streamlined but give you plenty of strategic opportunity and the fact that the game cannot stall out is a huge plus, it gives everything a more urgent and exciting feel. My one and only criticism of the game is the cards. The art, layout, and overall design are perfect; the card stock they are printed on is not. It does not ruin the experience but you’ll find yourself worried about the cards as they feel flimsy and easy to damage. Invest in some high-quality sleeves.